The state's Physician Education Loan Repayment Program will continue accepting applications from physicians who agree to practice in a Health Professional Shortage Area (HPSA), and treat patients in Medicaid and the Children's Health Insurance Program. In the coming months, TMA will focus its grassroots efforts on achieving its pro-medicine goals in the 2010 state and federal elections, and in the 2011 Texas Legislature. To help the association achieve legislative and political success, TMA invites you to 2010 Fall Conference Oct. 15-16 at the Hyatt Regency in Austin. TMA member physicians play an important role in the newly formed regional extension centers (RECs) created as part of the Obama Administration's 2009 economic stimulus bill. 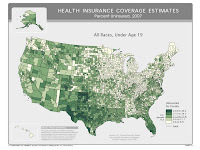 The U.S. Census Bureau today released its state-by-state and county-by-county uninsured figures for 2007. We already knew that Texas is the Uninsured Capital of the U.S. For those 65 and younger, 26.8 percent of Texans lacked insurance -- trailed only by New Mexico at 26.7 percent. For children (those under 19), the Census Bureau lists 19.5 percent of Texans and 18.1 percent of New Mexicans as not having insurance. Florida came in third in both lists. The updated county lists provide some new views of things. For residents under age 65, eight of the top nine counties are in Texas. The most uninsured county in the country is Kenedy County, south of Corpus Christi, headquarters of the fabled King Ranch. Here are the top five most- and least-uninsured counties in Texas, for the under-65 population and the under-19 group. Interesting to note that four of the five least-uninsured counties for Texans under age 19 are very poor South Texas counties. Looks like Medicaid and CHIP have quite good penetration there. Check out the table with figures for all 254 counties. We published census figures for those under 65 and those under 19. I would have included them in this post, but blogger doesn't play well with HTML tables. Sorry. Fees paid to physicians for treating patients in Medicaid and the Children's Health Insurance Program will be cut by 1 percent across the board on Sept. 1. The reduction will apply to all physician/professional services, as well as hospitals and other providers. A physician's delegation of prescriptive authority to a physician assistant or advanced practice nurse. An outbreak of dengue fever in the tropics and subtropics prompted an advisory to physicians from the Centers for Disease Control and Prevention (CDC). As part of its campaign to help Texas physicians survive and thrive in the new health care environment, TMA offers Health Reform School. Not only will you learn how the new health affects you and your practice, but also you will earn continuing medical education (CME) credit for your time. UnitedHealthcare has scheduled webinar training sessions on its 2010 Premium Designation Program in August. Blue Cross and Blue Shield of Texas (BCBSTX) has increased reimbursement for Prevnar 13, the new substitute for Prevnar 7 vaccine, to $131 for claims dated July 23 and after. Under new Drug Enforcement Agency (DEA) rules, physicians can now write electronic prescriptions for Schedule III, IV, and V controlled substances. However, Texas law still requires physicians to use a written prescription form for Schedule II drugs. Funding for uncompensated trauma care is under attack in Texas. Some local judges, lawyers, and lawmakers take issue with the controversial Driver Responsibility Program (DRP), which raises about $200 million every biennium for uncompensated trauma care. The program levies surcharges on people for Driving While Intoxicated (DWI), driving without insurance, driving without a license, and other violations. Opponents argue the DRP clogs state courts and increases the dismissal rate for DWI cases. And it doesn't help that Texas is facing a potential $11 billion to $18 billion budget deficit next year. Supporters -- including trauma physicians and nurses, Emergency Medical Services officials, hospital administrators, trauma survivors, and others -- stress that the DRP allows trauma centers to improve patient care. They say the funds make it possible for trauma facilities to purchase new, life-saving equipment and stay in business. This installment of Podcast TMA features commentary from Christopher Ziebell, MD, medical director of the Department of Emergency Medicine at University Medical Center Brackenridge in Austin. The cover story of the July 2010 issue of Texas Medicine makes the case for preserving the DRP and explains how the state allocates program funds. What physicians can do to show support for the DRP. The countdown has begun for physicians to take action in the settlement of a lawsuit against UnitedHealthcare over its system for determining "usual, customary, and reasonable" charges for out-of-network services. About $300 million is available to physicians who want to file a claim, but they must submit a claim form and any required documentation by Oct. 5. Funds from the Driver Responsibility Program (DRP) help make it possible for trauma centers to treat every trauma patient who comes through their doors, regardless of insurance status. But the Texas Legislature has held in reserve almost as much money as it has doled out since it approved the DRP in 2003. And, a potential multibillion-dollar budget deficit facing legislators, plus growing opposition from some local judges, lawmakers, and upset residents, has placed the program in jeopardy. Some people may love it; others definitely hate it. And still more are just trying to figure out what's in it. Regardless of how you feel about the health system reform bill signed in March by President Barack Obama, it is now the law of the land. And experts say it is likely to be the biggest change in the health care landscape in America since the enactment of Medicare in the 1960s. Few people truly know exactly what is in the measure or what its consequences might be, intended or otherwise. And stakeholders in the health care industry are scrambling to determine how to deal with it. The cover story in the June issue of Texas Medicine magazine takes an in-depth look at process that produced the health care reform bill and what its likely impact will be. In this installment of Podcast TMA, TMA President Susan Rudd Bailey, MD, of Fort Worth and TMA Board of Trustees member Douglas Curran, MD, a family physician from Athens, discuss how the health system reform law was enacted and what it portends for patients and their physicians. Whether the reform law will be good for patients and physicians. How elements of the reform law stack up against a set of guiding principles TMA developed for evaluating health care reform proposals. How the legislative process played out in a highly partisan atmosphere. What TMA is doing assist physicians understand the new law and maintain the viability of their practices in the new environment.